Tender for the 99-year leasehold land parcel at Fernvale Lane closed on Tuesday with four bids, the Housing Development Board said. The 21,999.90 sq m site with a gross plot ratio of 3.5 fetched the highest bid of $245 million from Peak Living Pte Ltd. The bid works out to $3,181.83 per psm/GFA for the proposed executive condominium development which has a maximum gross floor area of 76,999.65. The site is estimated to yield 770 dwelling units. Sunmaster Holdings Pte Ltd submitted the lowest bid of $232.5 million, or $3,019.49 per psm/GFA. (SINGAPORE) MCL Land yesterday drew crowds at its Ripple Bay condo showflat in Pasir Ris, selling 270 units in the 679-unit project by about 8pm. The developer had not crunched its numbers by press time but its CEO Koh Teck Chuan estimates that the average price when sales began in the morning was around $855 psf. As sales progressed, MCL upped prices to around $870 psf on average. ‘But we have not done a final tally on our average price,’ he said. A good spread of units – one, two and three bedders – have been sold. Buyers are mostly Singaporeans. Ripple Bay, which is within walking distance of Pasir Ris Beach, is in front of Far East Organization’s 473-unit Seastrand, where units are being offered for about $905 psf on average. Far East released the project in June last year and close to 100 units are still available. At Flora Drive in the Upper Changi area, Frasers Centrepoint has so far found buyers for 58 of the 120 units released at the 429-unit Palm Isles condo. Sales began on Wednesday evening. The average price is $830 psf, lower than $870 psf at which the nearby Hedges Park Condominium is going for. The 501-unit project, which went on the market in April last year, still has over 100 units available for sale. All four projects are on 99-year leasehold sites. For example, next to the Ripple Bay project, a Hoi Hup-led consortium bagged a condo plot in October last year for $361 per square foot per plot ratio (psf ppr) – or about 10 per cent lower than the $402 psf ppr which MCL paid for the Ripple Bay site in May 2011. Far East clinched the Seastrand site for $335 psf ppr in September 2010. Hoi Hup is planning to launch a 376-unit condo, Sea Esta, on its site around June. Because Hoi Hup paid a lower land price, and will probably do its own construction, it will be able to achieve a lower breakeven cost than MCL’s Ripple Bay and hence be in a position to price its project lower. Another point to note is that there are two nearby sites on the confirmed list of the GLS programme for first-half 2012. Credo Real Estate data shows that in all, there are 20 private condo projects which have yet to be launched on 99-year sites sold under the GLS programme since last year. No doubt, developers launching projects on these sites will have to size up existing and potential competition in the area. ‘You have projects launched before you that have units yet to be sold. And you have projects that will be launched after you. That creates the impetus for realistic pricing to remain competitive and be able to sell well,’ says Credo executive director Ong Teck Hui. Even so, pricing strategies among developers are by no means uniform. While the two launches this week point to some players at least being more nimble, BT has learnt of a reverse trend at some other developers – of holding or even marginally increasing price by raising the list price and then packaging in various tiers of discounts to appeal to buyer psychology. The net price, however, could be slightly higher than before. Talk in the market is that one major player started this practice to draw buyers following the introduction of the additional buyer’s stamp duty in early December. Its competitors have begun to follow suit. ‘Really, there are mixed signals in the market. Some developers may want to price more competitively to sell quickly and move on rather than risk being stuck. Others, especially with well-located projects near MRT stations or if they can differentiate themselves with unique concepts, lifestyle or product positioning, are confident of achieving their price while selling at a steady rate,’ says DTZ’s South-east Asia chief operating officer Ong Choon Fah. Meanwhile, all eyes are on the Urban Redevelopment Authority’s flash estimate private home price index for the first quarter. The index has moderated for nine consecutive quarters up till Q4 2011. It rose 0.2 per cent in Q4 over the preceding quarter. ‘If the price softening which has set in the secondary market spreads to the primary market, that is, developer launches, you will see impact on the index,’ said a seasoned market watcher. IN a sign that developers’ interest in executive condominiums (ECs) is still strong, a 99-year leasehold EC site at Punggol Central/Edgefield Plains yesterday received a top bid of $136.7 million, or $319.69 per square foot per plot ratio (psf ppr). The top bid, which beat nine others, was put up by Chinese firm Qingjian Realty (South Pacific) Group, which in November last year trumped four other developers with its $330 psf ppr bid for a 99-year leasehold residential site along Punggol Central. That it was a closely-contested tender, with the top three bids in close range of just 4.1 per cent, shows that there is continued keen interest for EC sites and the increasingly popular Punggol address, said Chia Siew Chuin, Colliers International’s director of research & advisory. The second highest bid of $131.8 million, or $308.23 psf ppr, came from City Developments Limited’s Sunmaster Holdings. A joint bid by BBR Development, BPK Development and Ryobi Kiso Holdings’ subsidiary Ryobi Development came in third at $131.37 million, or $307.22 psf ppr. ‘Based on the land cost of $319.69 psf ppr and the prevailing average selling price of newer EC units located in the area, a new project at the subject site could break even in the region of $630 psf to $640 psf,’ said Ms Chia. Based on the land price, Mr Ong said the breakeven price would be around $700 psf, which translates to a targeted selling price of between $750 psf and $800 psf. Prive, which is jointly developed by NTUC Choice Homes and Chip Eng Seng, is the first EC development in Punggol. That Punggol has become increasingly popular is clear, with recently launched residential projects selling well, he added. The 992-unit Watertown condominium in Punggol Central is around 95 per cent sold while the 728-unit Twin Waterfalls executive condominium at Punggol Walk is around 83 per cent sold, at the median prices of around $1,250 psf and $730 psf respectively, pointed out Mr Li. The top bid reflects a breakeven cost of $650 psf to $680 psf, and it is likely that the new project will be priced around $750 psf, he said. Nicholas Mak, executive director, research and consultancy, SLP International Property Consultants, expects the breakeven price for the site to be in the range of $620 psf to $640 psf. The subject site has a land area of 142,533 sq ft, and a maximum gross floor area of 427,600 sq ft.
(SINGAPORE) An executive condo plot next to the Tampines Trilliant project has been tipped by property consultants as the choicest among four residential plots released under the Government Land Sales Programme yesterday. ‘I think they want to send out the message that there’s enough supply. If there is demand, the government will release more land to support that demand,’ said DTZ’s SE Asia chief operating officer Ong Choon Fah. Three of the four plots released are in the confirmed list. They include two sites that can generate about 1,300 executive condos (ECs) – a public-private housing hybrid – at Tampines Central 7, next to Tampines Trilliant and near the future Tampines MRT Station under the Downtown Line; and at Woodlands Avenue 5/Drive 16, next to the completed LaCasa EC development. HSR Property Group special adviser Donald Han notes that end-demand for ECs will continue to remain robust especially after the government recently increased the allocation limit for second-timer buyers from 5 per cent to 30 per cent of units in the first month of an EC project’s launch. He expects the winning bid for the latest Tampines EC site to be $400-420 psf ppr, surpassing that for the next-door site sold last year. Others suggest a lower price. ‘Economic conditions have moderated compared with a year ago and there will be ample new EC housing supply,’ says R’ST Research director Ong Kah Seng, who forecasts a top bid of about $320-360 psf ppr. The Woodlands EC site has been tipped to fetch a winning bid in the $250-330 psf ppr range. Knight Frank research and consultancy head Png Poh Soon expects it to draw three to five bids. SLP International executive director Nicholas Mak says the site’s pluses include proximity to primary schools, the Singapore Sports School and parks. However, it is also near industrial parks and the Sembawang Airbase, and the possible noise level could make it less attractive. ‘Developers who participate in this tender would not bid aggressively,’ he added. As for the confirmed-list private condo plot at Tampines Avenue 10, the winning bid is predicted to be in the $350-465 psf ppr range. Credo’s Mr Ong says bid levels may be affected by the next-door plot on the reserve list. ‘Bidders for the (confirmed-list) site would have to consider the fact that the adjacent land parcel could be triggered for sale eventually, thereby posing competition,’ he added. (SINGAPORE) An ‘overly optimistic’ top bid, a whopping 18.6 per cent higher than the next, was put forth by Kingsford Development for a 99-year residential site located along Hillview Avenue yesterday. Its bid of $243.2 million or $638 per square foot per plot ratio (psf ppr) for the 136,147 sq ft plot with a plot ratio of 2.8 came even as other developers adopted a more cautious stance. The bid may have been pegged to The Hillier’s land price of $673 psf ppr when the site was tendered in April 2011, suggested Credo Real Estate executive director Ong Teck Hui. However, The Hillier’s land price takes into account a 15 per cent commercial element in the project, which contributed to its achieving the pricing level of its residential units, he noted. Li Hiaw Ho, executive director, CBRE Research, agreed, noting that the success of The Hillier, also on Hillview Avenue, could be the reason for the optimistic top bid for the site. Mr Li expects a breakeven cost of between $1,000 and $1,050 psf. The second highest bid of $205.1 million, or $538 psf ppr, put in by Flamegold Pte Ltd, a unit of UOL Group, was more in line with analyst expectations when the site was released for tender in January. UOL’s bid of $538 psf ppr could have resulted in a breakeven price of $900 to $950 psf, which ‘could provide the developer with some space to manoeuvre in the event of a softer market’, said Nicholas Mak, executive director of research and consultancy at SLP International. ‘The top bid for this Hillview site could result in a breakeven price of $1,010 to $1,060 psf. To yield a decent profit, the developer would have to sell the units in the development at prices above $1,200 psf,’ he added. An ACRA search shows that Kingsford Development has three shareholders, of whom one is based in Shenyang, China. The third highest bid came from MCL Land, at $190.5 million, or $500 psf ppr. Far East Organization’s Astor Properties and Tannery Holdings also put a joint bid with Sekisui House of $176.3 million, or $463 psf ppr. The lowest bid came from Capital Development and Qinghe, at $148.0 million, or $388 psf ppr. ‘Although the top bid is 5.1 per cent lower than the previous bid of $672.61 psf ppr submitted by Far East Organization in April 2011, we feel that the bid is a bit optimistic given that it is 18.6 per cent higher than the second bid and the previous site is a mixed use site while this is a pure residential site. We noticed that all the bids are slightly lower than the previous bids for The Hillier site which means that developers could be adopting a cautious stance,’ said Lee Sze Teck, senior manager for research and consultancy at DWG. As evidence that the mass residential market is still buoyant, Bartley Residences, located next to Bartley MRT Station, sold 210 units out of the 240 units released to date. Four 99-year residential sites, expected to yield 2,070 units, was released for sale under the government land sales programme yesterday. Three parcels – of which two are for executive condominium (EC) development – were launched for sale under the confirmed list. The third site is flagged for strata landed housing or condominium/flats development. The fourth parcel – available for application under the reserve list – too is flagged for EC development. While analysts concur that there has been a surge in EC supply, they remain divided over the potential impact on prices. He expects the price of ECs to moderate from the current range of $750 psf to $700 psf ‘in the coming months’. ‘This is definitely lower than current mass market condominiums which average approximately $900 psf,’ he added. Other analysts point to an increased pool of eligible buyers – the income ceiling for eligible applicants was raised from $10,000 to $12,000 in August last year – as a supporting factor. Two 99-year EC sites were launched under the confirmed list yesterday. The first, a 142,533 sq ft site at Punggol Central/Edgefield Plains, has a plot ratio of 3.0, which translates to a maximum GFA of 427,600 sq ft. It is expected to yield some 395 units. The second site, at Fernvale Lane, has a site area of 236,804 sq ft and a plot ratio of 3.5, which translates to a GFA of 828,816 sq ft. It is expected to yield some 770 units. Analysts expect both sites to attract moderately healthy interest from developers. ‘Notwithstanding ample new housing supply in the north-eastern part of Singapore, it is essentially a well-positioned growth corridor, holding much possibilities and potential in the longer term, especially when all the exciting thematic, lifestyle features are eventually in place,’ noted Ong Kah Seng, director of R’ST Research. He expects the top bids for the two sites to come in between $250-$290 psf ppr. He expects seven to 10 bidders for the site, with a top bid in the range of $280-$310 psf ppr. Mr Mak expects the site at Punggol to fetch a winning bid of between $280-$320 psf ppr, and the site at Fernvale Land to fetch a bid of between $270-$310 psf ppr. ‘Both sites could attract moderately healthy interest, possibly about four to eight bids each,’ he added. The tenders for the sites at Punggol Central and Fernvale Lane are expected to close on March 29 and April 3 respectively. The last site on the confirmed list – located at Elias Road/Pasir Ris Drive 3 – has a site area of 251,036 sq ft and a plot ratio of 1.4. Zoned for strata landed housing or condominium/flats, it is expected to host some 345 units. ‘(This site) is abutting a landed housing estate and near amenities such as Elias Mall and Pasir Ris Park. As Pasir Ris is a popular housing location, we could see eight to 12 bidders for this site, with a top bid coming in between $420-$470 psf ppr,’ said Credo’s Mr Ong. ‘This site can be expected to fetch a winning bid of about $126 million to $144 million, or $360-$410 psf ppr) in today’s market,’ he added. The tender for the site will close on April 11. On the reserve list, a 99-year EC plot at Punggol Way/Punggol Walk, which has a site area of 201,327 sq ft and GPR of 3.0, is expected to yield some 560 units. Under the reserve list system, the government releases a site for sale only if an interested party submits an application with a minimum price that is deemed acceptable. By contrast, land parcels under the confirmed list are sold according to scheduled dates. ‘The site may not be triggered for tender due to a potential supply glut in the EC market, especially in the north-eastern region of Singapore,’ said Mr Mak. ‘Should this EC site be triggered for tender, it can be expected to fetch approximately $157 million to $181 million, or $260-$300 psf ppr,’ he added. Credo’s Mr Ong added: ‘The Punggol Central EC site is a typical site within a HDB estate surrounded by public housing. Less interest is expected for this site . . . with a winning bid of between $250 to $280 psf ppr’. The Urban Redevelopment Authority (URA) has awarded the tender for the residential site at Bedok South Avenue 3 to F.E. Lakeside Pte. Ltd., FCL Topaz Pte. Ltd. and Sekisui House Singapore Pte. Ltd. The consortium submitted the highest bid in the tender for the site. F.E. Lakeside Pte. Ltd., FCL Topaz Pte. Ltd. and Sekisui House Singapore Pte. Ltd.
(SINGAPORE) A 99-year leasehold plot at Bedok South Avenue 3 drew seven bids yesterday, with the top bid from joint bidders, Far East Organisation’s F.E. Lakeside, Frasers Centrepoint’s FCL Topaz, and Sekisui House Singapore, at $345.9 million, or $534.22 per square foot per plot ratio (psf ppr). 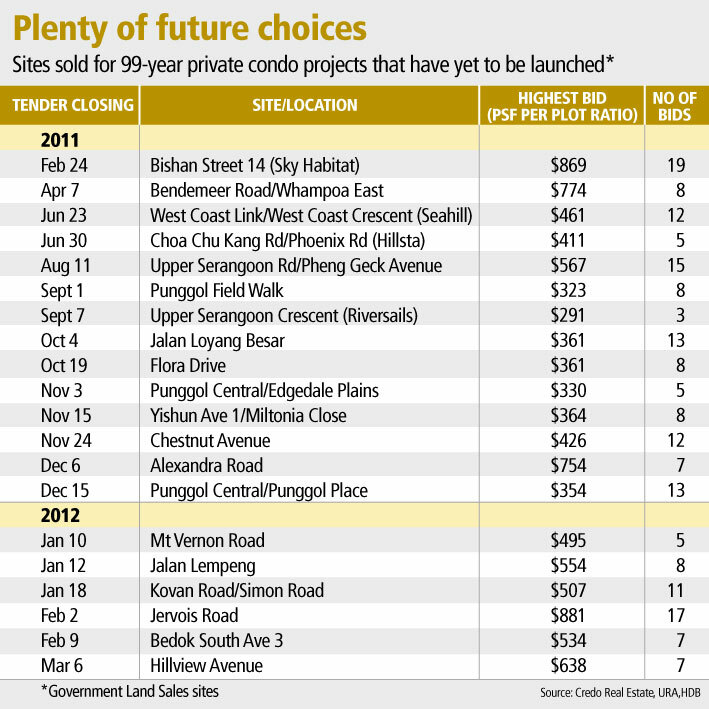 While the seven bids received may seem lacklustre, coming on the back of the hotly-contested site at Jervois Road which last week drew a whopping 17 bids, it does not signal waning interest, said Credo Real Estate executive director Ong Teck Hui. ‘The absolute price of nearly $346 million is hefty and such sites are usually only contested by the bigger players. For example, the Mt Vernon site which fetched $388 million had only 5 bidders while the $408 million Jalan Lempeng site attracted 8 contestants,’ he noted. The top bid of $534.22 psf ppr was a thin 1.5 per cent higher than the next highest offer of $526.34 psf ppr from UVD, a joint venture company between Singapore Land and UOL Group. A third bid came from Kingsford Development, at $301.2 million, or $465.10 psf ppr. An ACRA search shows that the company has three shareholders, of whom one is based in Shenyang, China. The lowest bid came from Soilbuild Group, at $235.2 million, or $363.29 psf ppr. Other bidders include MCL Land; a joint bid by Sunmaster Holdings, Intrepid Investments, and Hong Realty; and Mezzo Development. The three joint venture partners who submitted the top bid – Far East Organization, Frasers Centrepoint, and Sekisui House – expect the site, which is located next to Bedok Court and has a maximum gross floor area of about 647,491 sq ft, to yield an estimated 600 units comprising a mix of one to four-bedroom apartments. The partners had previously collaborated for the 992-unit Watertown in Punggol, of which 854 units have been sold since its official launch on January 20. In addition, Far East Organization and Frasers Centrepoint had previously worked together to develop the Waterfront Collection at Bedok Reservoir. Based on caveats lodged from November last year to date, it is likely that the units in the new residential project will be able to fetch around $1,100 psf, he said.